Sorry for the long delay, but I’m back!! 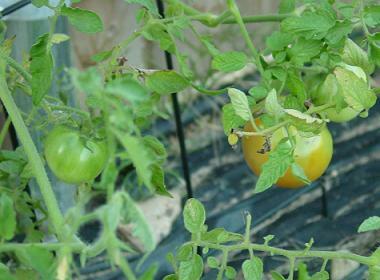 My garden woes this year have been well documented in this blog, from the non-producing tomato plants to the stolen cantaloupes. After the third time I discovered an eaten cantaloupe out there I basically washed my hands of the garden. I decided enough was enough and didn’t even worry about it. I stopped watering and never even went back there to check on things. I was so frustrated with the lack of production over the summer that I forgot all about how things always pick up quite a bit in the fall. 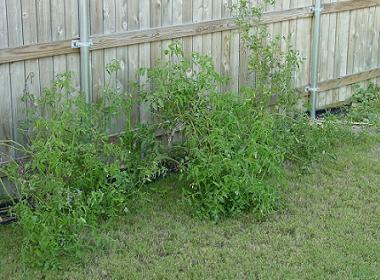 Same as happened last year, when the weather cooled a little bit the garden started growing again. Despite my neglect (as you can see from the sorry state of my “jungle”, there was some serious neglect) the garden has rebounded quite nicely. We have already harvested some green onions that were put to good use, there must be at least 15 tomatoes growing in the jungle, and I even spotted a couple of cantaloupes growing. I’m not keeping my hopes up for the melons because I’ve been burned too many times already, but it’s nice to see some production. Looks like we won’t be stuck with just the one $20 tomato. Maybe we’ll have 20 $1 tomatoes instead. The baby’s blog is finally up and running — although we still have work on the aesthetic aspect. You must enter your email address to access the site (and your email address must be on my approved list). If you have problems getting in, send an email to baby@deweyltd.us and I will make sure your email address is added.